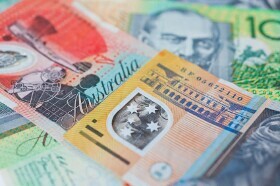 The Australian dollar declined today after the Reserve Bank of Australia downgraded its growth and inflation forecasts and reiterated that chances for an interest rate hike and a cut are “balanced” now. The losses were limited, though, and the currency has currently moved away from day’s lows. The RBA released it Statement on Monetary Policy for February, in which it slashed its economic projections. Gross domestic product is now expected to grow by 3% by the end of 2019, down from 3.25% in the previous estimate. The expected growth of the Consumer Price Index is at 1.75% now, down from 2.25%. Trimmed mean inflation is expected to be at 1.75% by the end of this year, down from 2% in the previous forecast. The outlook for the unemployment rate remained unchanged at 5%, though it is now expected to stay at that level till June 2020, whereas in the previous forecast it was expected to fall to 4.75% by that time. The Board continues to judge that further progress in reducing unemployment and bringing inflation into the target range can reasonably be expected. If that scenario should come to pass, higher interest rates would become appropriate at some point. Other scenarios, in which the labour market and consumption growth are weaker than currently expected, are also possible. If there were then to be a sustained increase in unemployment and a lack of progress in returning inflation to target, it might instead be appropriate to lower the cash rate. In light of the recent data and the inherent uncertainties around the forecasts, the probabilities of these two sets of scenarios have shifted to be more evenly balanced than previously. The Board therefore does not see a strong case to adjust the cash rate in the near term. AUD/USD fell from 0.7099 to 0.7078 as of 10:25 GMT today, touching the low of 0.7060 intraday. EUR/AUD gained from 1.5963 to 1.6007, though retreated from the session high of 1.6059. AUD/JPY traded at about 77.74 after opening at 77.96 and falling to the daily low of 77.44.